In 2015, HFG began work in Ukraine, collaborating closely with local country partners to design and introduce strategic purchasing approaches for the hospital system tailored to Ukraine, toward improved resource use and better health outcomes. To help health decision makers better allocate resources and streamline TB-specialized hospital networks toward improved care, HFG worked with the Health Departments in Poltava, Odesa, and Lviv oblasts and Kyiv City, and with the Ministry of Health to introduce elements of strategic purchasing for the tuberculosis hospital system. This would empower health departments to redirect crucial resources toward those patients who need them most, toward improved patient outcomes. We collaborated with the MOH and regional partners to roll out the analytical systems we developed and used for the TB work. Beginning in 2017 with Poltava oblast, we introduced cost accounting and a discharged patient database in general hospitals; this fed into a general hospital performance monitoring system for the oblast and design of new payment system for the hospitals. We developed a unified cost accounting methodology for health providers in Ukraine. We worked with local health departments and hospitals to carry out a cost accounting analysis in all hospitals in Poltava Oblast, and in hospitals across Lviv and Odesa Oblasts. Analysis from Poltava is feeding into the design of the new case-based hospital payment system on the national level. In 2017, the cost accounting methodology which HFG had developed and piloted in four regions of Ukraine received approval from Ukraine’s Cabinet of Ministers to become the single methodology to be used in developing new payment systems and setting national tariff policies. In total, HFG’s data analytics system now covers 180+ hospitals in three regions of Ukraine, and over 1.5 million discharged hospital cases. We worked closely with our partners in pilot areas to create an electronic database of the discharged patient data. We used costing and discharged patient data and developed a Hospital Performance Monitoring System, which analyzes performance metrics such as average length of stay, bed occupancy, case mix, cost drivers, and patient demographics. The system’s electronic dashboard and individual facility reports allow health departments and hospitals to see if they are hospitalizing the right patients for the right amount of time. For example, the system showed a big variation of the admission rate for Ambulatory Care Sensitive Conditions (ACSCs) - from 5% to 60% of patients among hospitals, which means that these patients were being unnecessarily admitted and receiving treatment that could be provided at a lower cost in outpatient settings. ACSCs are an example of acute, chronic, or vaccine-preventable conditions that we use as markers for assessing health services delivery performance. The performance monitoring system also showed that hospitals were keeping patients longer than needed to keep beds full when they did not have many admitted patients. In 2018, HFG undertook a study to estimate the underfinancing of drugs for hospitalized patients in Poltava Oblast. The study, which examined 4200 cases across 11 hospitals, showed that patients were making high out-of-pocket payments for drugs and also demonstrated that just over half of prescribed medicines purchased by patients had a strong evidence base. 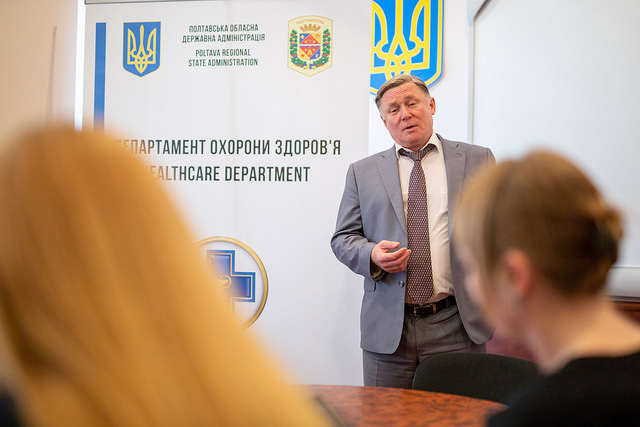 The study results provided evidence for oblast health authorities and NHSU to take action to improve clinical practice and increase hospital budgets to reduce out-of-pocket payments for medicine at the hospital level. We also developed a simulation module Integrated into the online platform, which enables health departments to see cost savings that can result from changes in service delivery practices. For example, health departments can estimate the costs which would be saved by reducing hospitalization of non-TB patients or by reducing average length of stay. In pilot regions, decreasing the average length of hospital stay and eliminating hospitalization of non-TB patients in TB hospitals can reduce the number of bed-days by 80% and decrease admissions by more than 50%. HFG provided extensive support to the NHSU and MOH to design a new case-based payment model and define steps to go from current input-based line-item payments to the more comprehensive diagnostic-related groups (DRGs) for inpatient care. In May 2018, the NHSU and MOH received approval from the prime minister to move forward with piloting the proposed hospital payment system in Poltava Oblast (and potentially additional oblasts), beginning in 2019. As a result of a series of trainings plus the operating systems we put in place and handed over to NHSU, the NHSU now has the conceptual framework and practical tools in place to improve strategic purchasing functions and move forward with piloting the new case-based hospital payment system in 2019. Ministry of Health of Ukraine, National Health Service of Ukraine (NHSU), and Center of medical statistics of the Ministry of Health of Ukraine. Hospitals (local, regional, and national levels) located in Poltava, Odesa, Lviv oblasts and Kyiv city. Ukraine: Is It Cost-Effective To Integrate HIV Counseling and Testing into Primary Health Care? We developed a unified cost accounting methodology for health providers in Ukraine. We worked with local health departments and hospitals to carry out a cost accounting analysis in all hospitals in Poltava oblast, and in hospitals across Lviv and Odesa Oblasts. Analysis from Poltava is feeding into design of the new case-based hospital payment system on the national level. In 2017, the cost accounting methodology which HFG had developed and piloted in four regions of Ukraine received approval from Ukraine’s Cabinet of Ministers to become the single methodology to be used in developing new payment systems and setting national tariff policies. For example, the system showed a big variation of the admission rate for Ambulatory Care Sensitive Conditions (ACSCs) – from 5% to 60% of patients among hospitals, which means that these patients were being unnecessarily admitted and receiving treatment that could be provided at a lower cost in outpatient settings. ACSCs are an example of acute, chronic, or vaccine-preventable conditions that we use as markers for assessing health services delivery performance. The performance monitoring system also showed that hospitals were keeping patients longer than needed to keep beds full when they did not have many admitted patients. In 2013, HFG undertook a cost efficiency study on the viability of providing HIV services through the general primary health care network, rather than through specialized HIV clinics. HFG worked in collaboration with the Chernihiv oblast health department to provide training and ensure access to necessary equipment and supplies for HIV counseling and testing at the primary health care level. Our study demonstrated that in the pilot districts of Chernihiv oblast, the number of HIV cases detected per capita doubled; the number of people tested from among the most at-risk populations increased eightfold; and the cost per detected case decreased by 34 percent in pilot areas versus non-pilot areas. These results provided the Ukraine government with evidence and lessons on integrating HIV counseling and testing into non-specialized primary health care, thereby contributing to the national policy dialogue on HIV integration into primary health care as a way to improve access and efficiency. Health departments in Poltava, Odesa, and Lviv and Chernihiv oblasts and Kyiv city. Hospitals (local, regional, and national levels) located in Poltava, Odesa, Lviv oblasts and Kyiv city; PHC facilities in Chernihiv oblast.